Grandma and Papa Boston flew in to town for the long weekend and we packed in lots of fun while they were here. They arrived Saturday afternoon and left Tuesday AM, but along the way we went to a BBQ, played some bocce with our old neighbors, ate some delicious meals, went to the new SF MOMA (more on that trip later), went to the park with some old friends, went bike riding, walked all over, read, introduced Grandma to Totoro and just had a blast. Whew, I’m tired just thinking about it. And that doesn’t even count Grandma and Papa’s visit to Lauren’s classroom on Tuesday morning, which by all accounts, was pretty epic! It was definitely enough to tied us over until later in the summer when we all get together again! Great Grandma Kiyoko lived in a assisted living home – but seeing the old people needing help around never phased Maile and Lauren. They always went right up and gave GG a big hug and spent some time with her before racing off to the pool. The pool was definitely their favorite part of the visit. For Daddy it was always a little bit too cold (for some reason it was built in the shadows of the building or something – never seemed to get direct sunlight and was always freezing! ), but the girls never cared – they absolutely loved being in that pool. We then talked about how we could remember GG and we decided that we would think of her whenever we went swimming because we love to swim and swimming was a bit part of our visits to see her. That felt right to all of us. 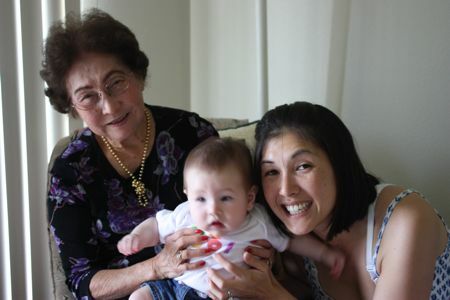 We love you Great Grandma Kiyoko and we will miss you always! One more from the Maker Faire. We found this booth that had this cool puzzle game based on Houdini. Basically there are 40 different ways to setup the puzzle and you need to help Houdini “escape” each time – each level gets progressively harder. Family picture - we had an awesome day! What are ukus? The Hawaiian word for head lice. Yep, another milestone has been reached – Maile Girl came home from school with lice last week. The word went out from the school on Wednesday that we should be on the look out. We checked the girls Wednesday night and thought we were all clear – even making a joke about sharing combs on Thursday AM (of course we did). The girls went off to school and we thought all was well. And then the dreaded call just before lunch – the outbreak was bad enough they had brought in the experts and Maile was found with some of the little buggers. Lauren was clear, but we picked both girls up, headed over to the Hair Fairies for some gear and then came home and started the treatment and doing a ton of laundry (hat tip to Christine for taking the brunt of that one). Hard to believe another year of dancing is in the books. On Saturday Maile and Lauren had their dance recital at Nagata Dance. We continue to really enjoy our time at Nagata Dance – they do a really nice job of making dance fun and relaxed – the girls love it! Maile and Lauren got some slime stuff at a birthday party we went to today and they used it to create a fart instrument. They were quite pleased with themselves. And I had nothing to do with it. Seriously, they did this all on their own. Sure, I got a smile for you. On Friday, our old nanny, Kelly, watched the girls since they didn’t have any school. She was making some lunch for the girls and when she came out she caught this cute scene of Maile reading to Lauren. We had a pretty fun Mother’s Day weekend here in San Francisco. The girls treated mommy to some home made cards, massages(!) and a new outfit picked out by Maile Girl. Daddy delivered on a pretty nice dinner date (if I do say so myself) on Saturday night and a great Sunday brunch at a new Hawaiian spot (aina – check it out if you are in SF).